Such an eye-pleasing diaper cake! Not finding out the gender of a baby shower doesn't mean that you are limited in your colors or decor. Just look at this gender neutral diaper cake submitted by Joanna. She used some fantastic colors that could be used for either a boy or a girl. Joanna's diaper cake is such a lovely addition to our diaper cake gallery! We have to best collection of diaper cakes on the internet and it is all thanks to our amazing readers. Thanks Joanna! 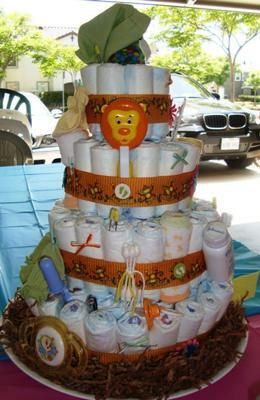 Your diaper cake is delightful! 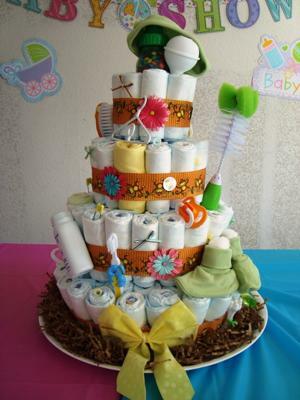 Follow the link at the bottom of this page to share YOUR diaper cake ideas! For this 4-tier diaper cake, I used all sorts of neutral colors. The blue and pink flowers that I added were specially for my friend who did not want to find out the gender of her new baby!